A summary of the Investment Case was released on 11 January 2019, ahead of the replenishment preparatory meeting which will take place next month in New Delhi, India. The full Investment Case document has been provided to Board members but has not yet been released publicly. On 11 January, as reported in the last issue of GFO, the Global Fund also announced that it has set a target of $14.0 billion for the Sixth Replenishment. This article covers three topics: (1) the Investment Case; (2) the $14 billion target; and (3) comments from civil society on the target. Please see the separate article in this issue on the preparatory meeting. The purpose of the Investment Case is to provide a strong rationale for why donors should increase their contributions to the Global Fund. From 2002–2018, the Global Fund has invested $19.6 billion in HIV programs (20% of all international funding); $8.2 billion in TB and TB/HIV programs (65% of the funding); and $11.4 billion in malaria programs (57% of the funding). Table 1 provides selected key results of these investments. A second example of threats is the fact that more than 10 million people fall ill with TB every year, 40% of whom are “missed.” Multiple-drug-resistant TB is increasing (in 2017, it infected more than 600,000 people) and is difficult and expensive to treat. HIV programs also face challenges related to resistance. In sub-Saharan Africa, more than 10% of people starting antiretroviral therapy have a strain of HIV that is resistant to some of the most common HIV drugs. A further reason why increased funding is required is that the Global Fund is stepping up its investment in new tools and innovations –– for example, piloting new mosquito nets to combat insecticide resistance in Africa. The Investment Case states that we need (a) more innovation in diagnostics, prevention, treatment and delivery models; (b) greater collaboration; (c) a relentless focus on improving execution; (d) more granular and timely data; and (e) more money. The Investment Case states that the target of at least $14.0 billion for the Sixth Replenishment represents an increase of 15% ($1.8 billion) over the $12.2 billion raised during the Fifth Replenishment period. Table 2 shows the targets and actual pledges for the last four replenishments. 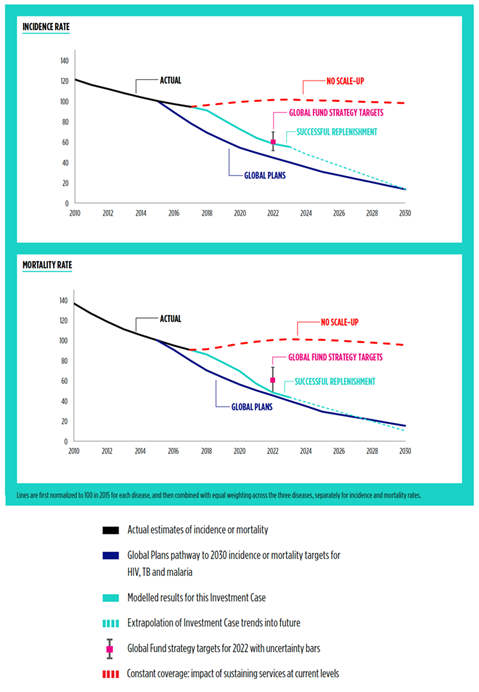 1 For the Second and Third Replenishments, the Global Fund set a range of targets based on multiple scenarios. 2 This row shows total pledges made at the replenishment conferences held in September or October of the year preceding each replenishment period. Note that in each replenishment period, some pledges are made after the replenishment conference, though the amounts involved are not very significant (for example, about $100 million for the Fifth Replenishment). Historically, virtually all pledges have been converted into contributions. The Global Fund says that contributions of at least $14.0 billion would enable the Global Fund to save 16.0 million lives in the period 2021–2023; reduce mortality rates by more than half by 2023 (over 2017 levels); and avoid 234.0 million infections. It would also enable programs supported by the Global Fund to accelerate progress towards Sustainable Development Goal 3 and universal health coverage; to strengthen health care systems; and to tackle inequities in heath (such as human rights– and gender-related barriers). The figure below shows projected incidence and mortality rates for the three diseases combined based on different funding scenarios. The Investment Case states that total funding from all sources should grow from $66.0 billion in the current cycle (2018–2020) to at least $83.0 billion for the next cycle (2021–2023), an increase of $17.0 billion. As we said in an article in the last issue of GFO, some civil society organizations involved with the Global Fund have declared that the investment case is not ambitious enough with respect to the existing needs and gaps in the HIV, TB and malaria responses. The Global Fund Advocates Network (GFAN) said in a statement that the $14.0 billion target is not enough to significantly step up the response to the three diseases. In a report released in July 2018, the Global Fund Advocates Network (GFAN) had called for a replenishment of between $16.8 billion and $18.0 billion. On 25 January, Devex reported that 137 members of the U.S. Congress sent a letter to the Trump administration asking for an increase in the U.S. contribution to the Global Fund. The letter does not include a specific funding request, in part because it was drafted before the Global Fund announced its $14 billion target. But Chris Collins, president of Friends of the Global Fight, said the U.S. should contribute about $4.8 billion ($1.6 billion a year). The U.S. pledged $4.3 billion for the last replenishment in 2016.